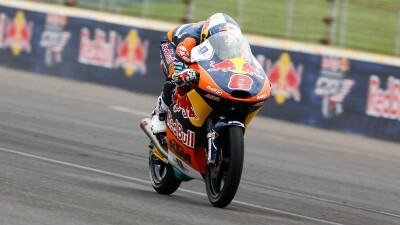 Red Bull KTM Ajo rider Jack Miller took third position at the Red Bull Indianapolis Grand Prix in an intense race, increasing his lead in the World Championship standings. Miller managed his tyre strategy well to cross the finish line in third position and increase his advantage to 21 points, following an awesome battle at the front involving ten riders, including all the championship frontrunners. A strong start for Miller from pole position saw him push hard to lead the first three laps. After observing that the characteristics of the circuit would prevent an escape from the group, the Australian preferred to allow his competitors take the initiative and follow in the front group – consisting of between 7 and 10 riders. Miller fought for the win, but it was on the last lap where he took a place on the podium.